The most complicated piece of letter that we end up writing in our lifetime is a love letter. 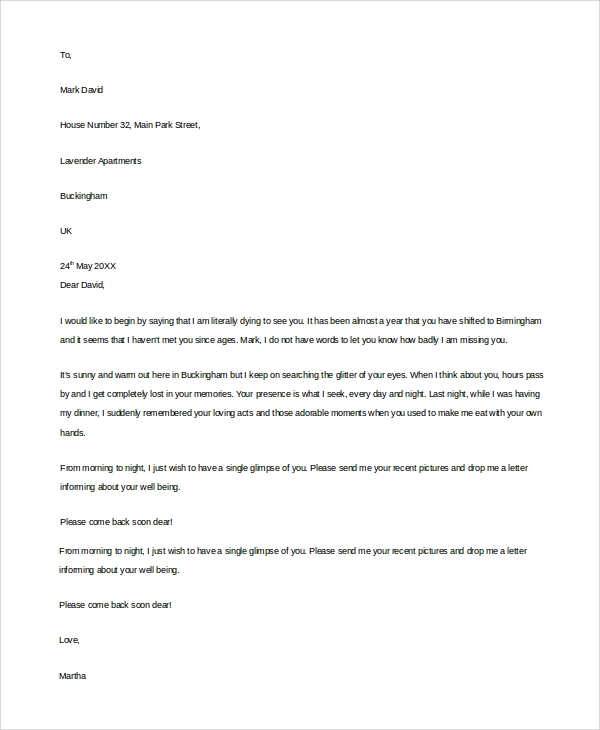 We have to write various kinds of personal and professional letters. But, love letter is completely a different thing. The letter should be well crafted, wrapped with emotions and love. However, for ease of understanding, letter should maintain a proper structure too. You can create some excellent personal letters for someone special with the Sample Love Letters. Make your dearest one feel special on his birthday with a well-written love letter. 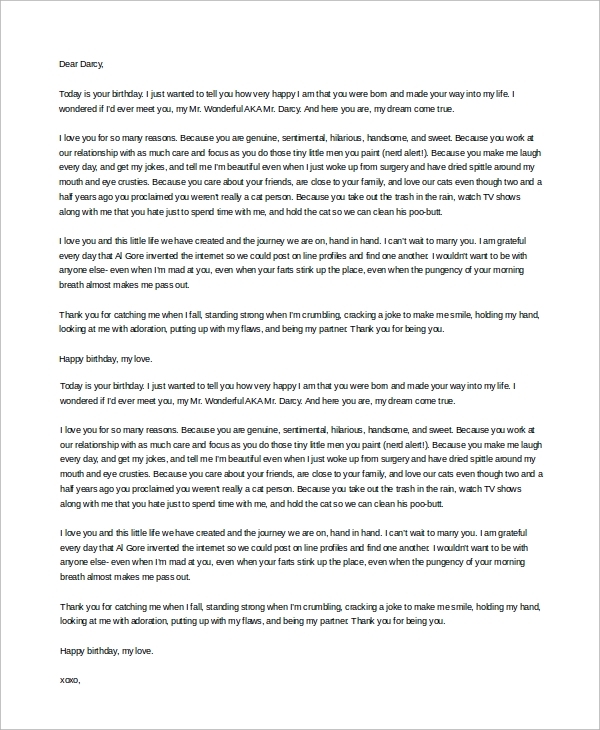 Show your love, affection, and emotions for the person through this piece of letter. Use this sample to create your letter. Everyone has their own unique ideas for romanticism, but not all of us can express our thoughts or ideas. You can use this sample for this purpose. 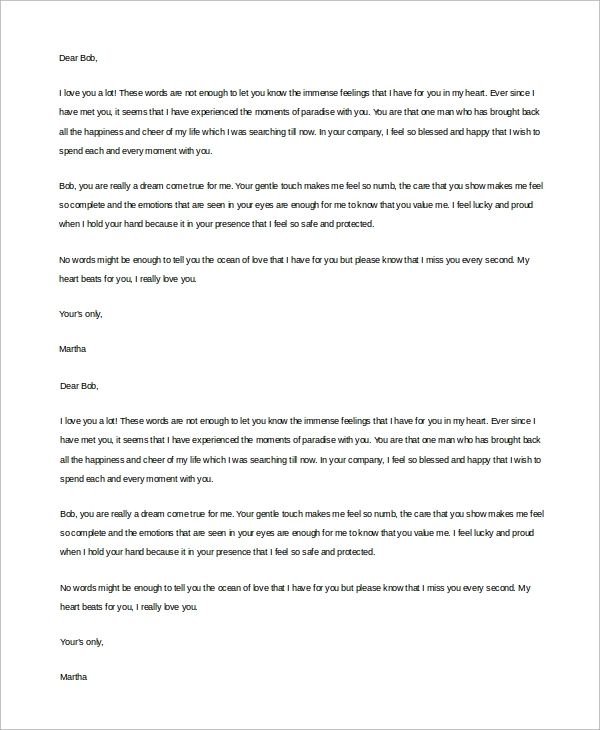 Download this to create a seamless love letter for someone special. If you want to write a long letter for someone special and near to your heart, this sample can be of great use for that purpose. Use this long love letter to impress your husband or boyfriend. As the name suggests, love letters are written to express love for someone close to your heart. If you love someone, then you need to express your feelings for that person. With this gesture, you can make your nearest or dearest one feel happy as well as special. People cannot express their love by saying. Thus, they choose to write letters to express their love. 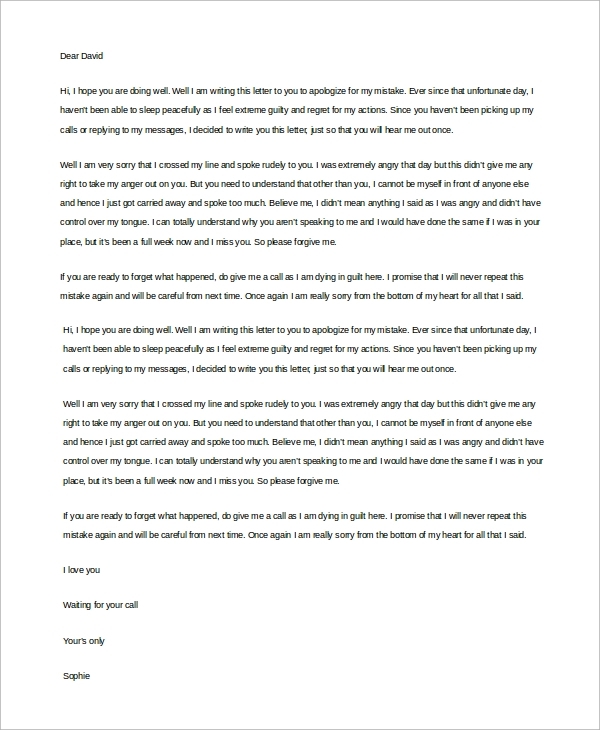 You can also see Sample Apology Love Letters. 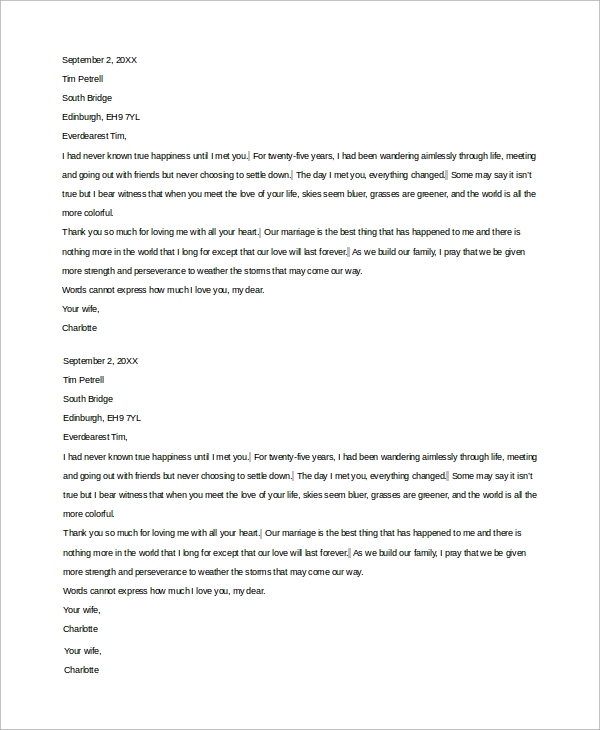 Use these online samples for love letters to express your love with precision. Using the online samples will save your time. Moreover, they will help you to unleash feeling with beautiful words. Reignite the charms of love and passion in your life through well written love letters. Sometimes, we make mistakes in the relationship and hurt our partners. In order to please your partner and to admit your mistakes, you can choose to write love sorry letter, using this sample. People cannot express love for their spouse through words, and thus they should write to express their love. 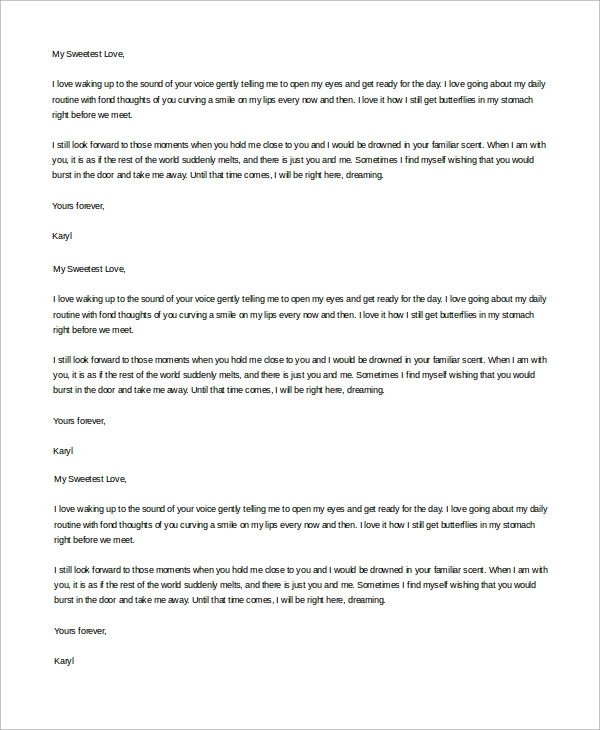 Use this sample love letter for a husband to impress your husband. Who Should Use these Love Letter Samples? Many people are not sure how to express their love to someone special. Some people do not believe in expressing. However, it is advised that when you are in love, you should express your love through concrete words via a beautifully crafted letter. A nicely written Love Letter Samples can reignite the charms of love as well as passion in your life. Moreover, expressing feelings for someone makes that person feel special in your companionship. So, take the opportunity to impress your partner with finely crafted love letters. Online samples are available for you. Download the samples and create your love letters seamlessly. Writing love letter is a thing that you need to master with precision. It is a way of expressing your feeling for someone special. Make this way of expressing feeling special and passionate with a well crafted love letter. Find some excellent love letter samples online. Following the samples will help you to crate love letters with precision. You can also see the Sample Love Letters for Her.